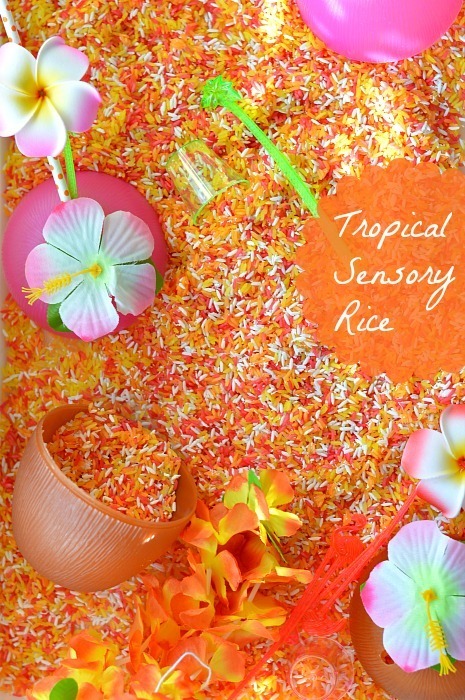 Bring the tropical fruits home with this scented, fruity sensory rice recipe. The post contains affiliate links. If you choose to shop through these links, I will receive a small commission. Thanks for supporting the blog! 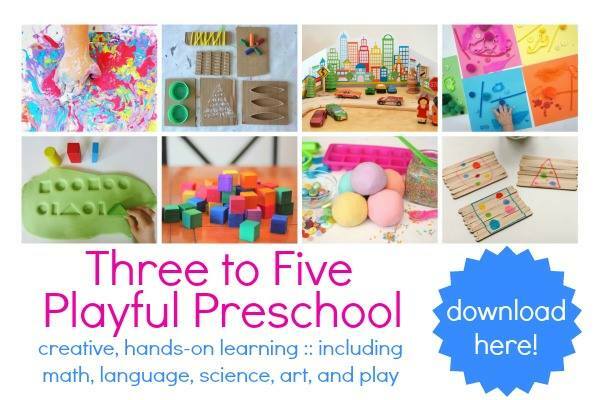 Summer is almost there and it’s time for all-day play time to begin! 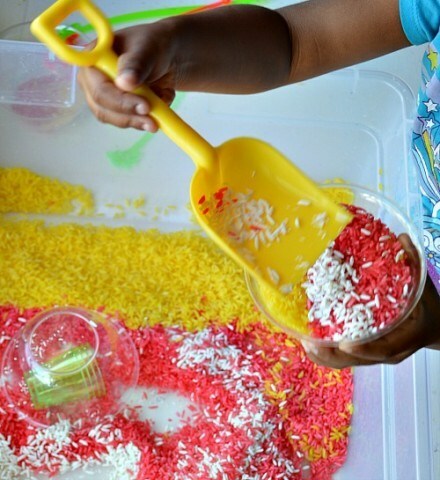 One of our kids’ favorite activities are sensory activities. This time last summer we were incesantly talking about our upcming summer vacation to Hawaii. It has been an year and the children talk about it! 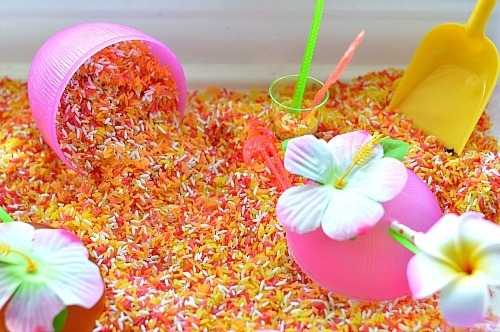 So I presented them with a fun new sensory activity with all the scents from hawaii- Tropical fruits sesory bin pretty much Aloha spirit in a box. We have here mango rice, coconut rice, watermelon rice and pine apple rice nicely presented because mom here just loved the rice just as much as the kids. So when the kids are away at preschool mom does this ! My trip to the dollar store made me go crazy with the tropical party supplies. 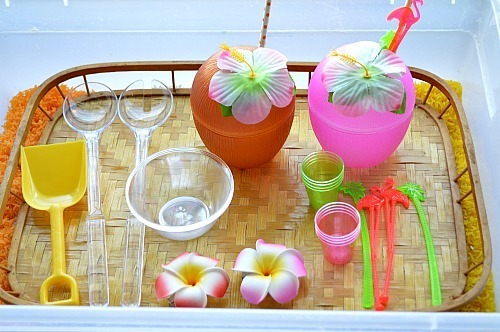 I picked up so many goodies from there – coconut drink containers, mini shot glasses for scooping, pouring and making concoctions, our plumeria hair clips, drink stirrers, shovels and cute straws. 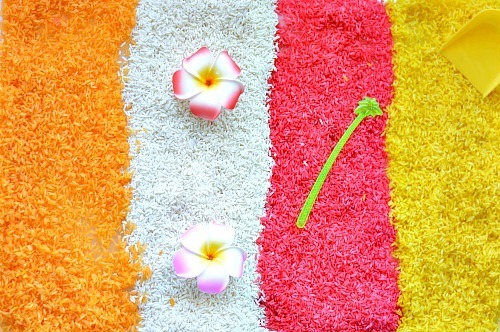 The colors and scents of the rice were out of this world! 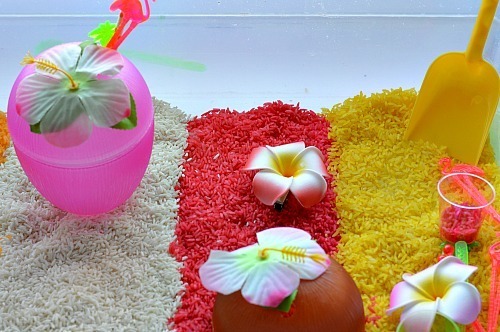 The props just complimented the rice beautifully. 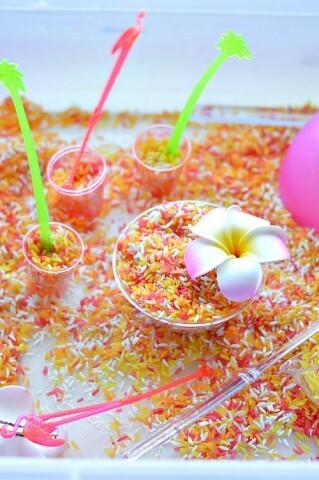 I can’t get over how cute this coconut shell drink container is. 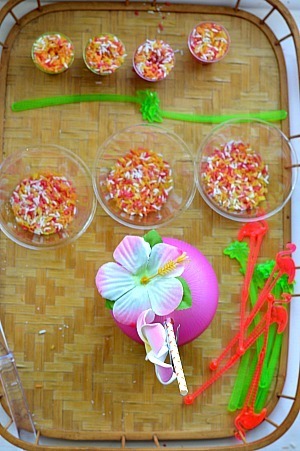 The plumerias scattered around gave it a very tropical feeling is the scents were not enough! 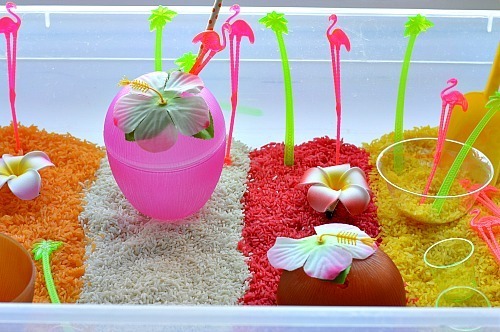 Well the trees and birds stirrers were perfect background for the sensory bin. Competing party platters I must add. Special watermelon mango drink from the 3 year old. I can’t decice which was more prettier? 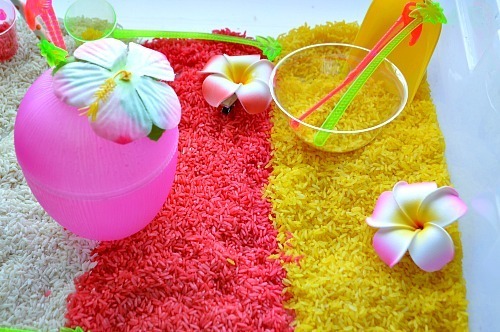 The mixed up tropical punch rice or the individually laid out rice. Obviously playtime means MIXING! Hope you all make this yummy sensory rice and enjoy this fun sensory activity with your kids. 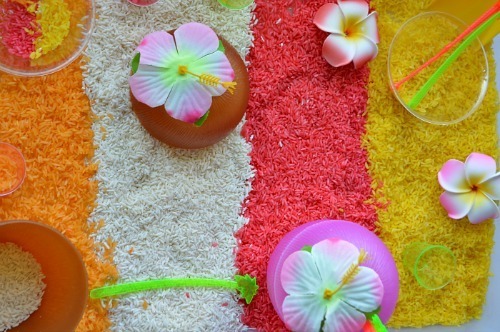 I used up 3 small bags of plain white rice from the dollar store for the 4 scents. 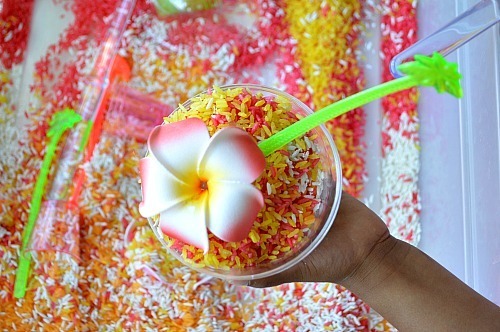 We did mango, pineapple, coconut and watermelon. I used 2 envelopes of the mango drink mix to scent the rice. I also added 2 tablespoons of yellow liquid watercolor. 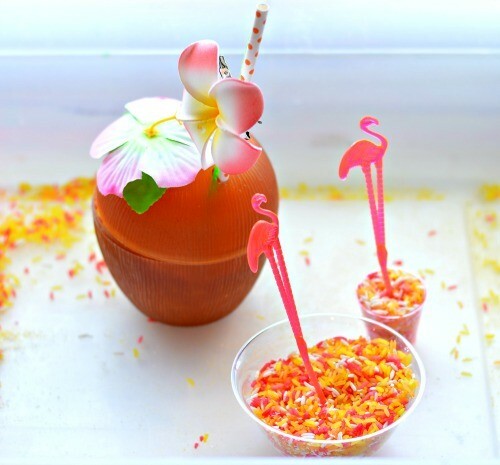 Our mango drink mix gave us an uncharacteristically orange color so adding the liquid watercolor gave us a better color. It was fine because we wanted it to be a bit different than the pineapple yellow. For this I used pineapple Jello (product link above in the materials section) to scent the rice. This one is tricky since going overboard with the gelatin powder will result in a very sticky rice! 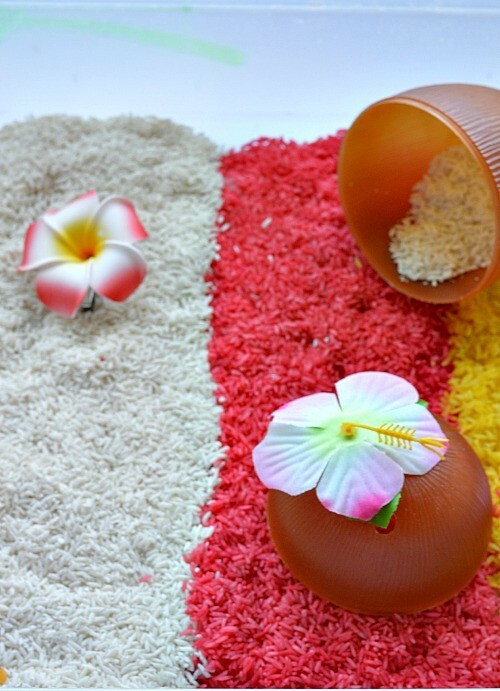 Follow the tips and tricks by Fun-A-Day on their scented rice post. After you make all the baggies of colored rice, lay them all out in cookie sheets of flat trays to let them dry. Line the cookie sheet with wax paper so that the rice doesn’t stick. I microwaved the rice for 30 seconds on dinner plates and was able to use the rice right away. The best way to do it is to let it dry overnight for the best experience with easy, dry, scoopable rice. 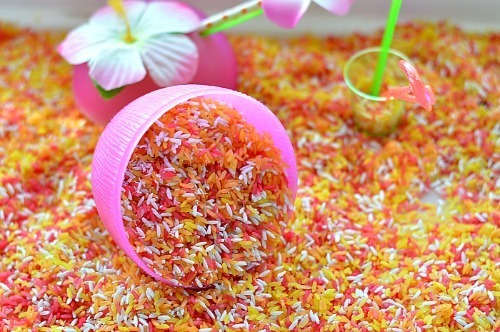 For a basic tutotial or dying rice or dying anything visit Fun At Home with Kids for their colored rice tutorial.